Elmira, NY—A pair of slow starts sent the Mentor Ice Breakers home without earning a point in the team’s two-game series in Elmira against the Enforcers over the weekend. The Ice Breakers kept things close on Friday night before allowing five first-period goals the following evening in a blowout loss. The Ice Breakers didn’t come out ready to play on Friday night, and it ended up costing them. Ahmed Mahfouz got the Enforcers on the board just 21 seconds into the game before a power-play goal from Mitch Atkins stretched Elmira’s lead to 2-0. Forward Kyle Stevens capped off the scoring in the Enforcers’ big first period with his eighth goal of the season to give his team an early 3-0 lead. Mentor was able to settle things down from there, but the damage was already done. Elmira made it a 4-0 game at 11:41 of the second period off Dmytro Babenko’s seventh goal of the season and his third against the Ice Breakers. Nate Farrington broke Elmira netminder Troy Passingham’s shutout bid late in the second period with a power-play goal that was assisted by Joe Swenson and Gordy Bonnel. Farrington took a pass from the opposite circle and fired a one-timer that Passingham, who was recently named the FHL’s goaltender of the month for January, was unable to catch up to. It was the second goal in as many games for Farrington, who has a 7-13-20 scoring line over 31 appearances. Declan Conway made it a two-goal game just 1:38 into the third frame with another power-play tally. Dzmitry Daniliuk and Patrick Porkka factored in with assist on the goal, which was Conway’s first since returning to Mentor’s lineup following a lengthy absence due to injury. Ondrej Gabrhelik took back any momentum the Ice Breakers had gained at 14:48 with an even-strength goal to restore Elmira’s three-goal lead. Mahfouz had an outstanding night and was involved with all five Enforcers goals after dishing out four assists and netting one of his own. Stepan Timofeyev racked up a career-high five assists and Stevens added a goal and an assist. For Mentor, Derek Moser made 19 saves after replacing John Sellie-Hanson midway through the opening period. The Ice Breakers had a solid performance on the power play, converting on two of their four opportunities. Elmira went 1-for-4 on the man advantage while Mentor out-shot the Enforcers 36-27. The Ice Breakers have had their fair share of slow starts this season, but they all pale in comparison to what happened on Saturday evening at First Arena. The Enforcers were relentless in their attack of Mentor’s defense, racking up a staggering five goals in the opening frame. Timofeyev made it a 1-0 game just two minutes into the contest before Stevens stretched Elmira’s lead to 2-0 at 9:04. Ice Breakers forward Matt Kadolph cut the Enforcers’ lead in half after finishing a nice passing play with Patrick Porkka, but Brandon Vuic, Mahfouz, and Brandon Hussey all found the back of the net over the final seven minutes of the first period. The Ice Breakers were clearly frustrated in the second period, but the game remained relatively clean as the Enforcers added two more goals. Stevens netted his second of the night and fourth in his last four games midway through the period to push Elmira’s lead to 6-1 before Glen Patterson scored the final tally of the night at 12:32 on the power play. Tempers began to flare early in the final period when Bonnel and Timofeyev dropped the gloves just 33 seconds after the puck dropped. Bonnel landed a couple of hard shots before being taken down by Timofeyev. At 6:04, a scrum broke out behind the Ice Breakers net after Brendan Hussey shot the puck into Mentor’s net after a whistle and sarcastically celebrated. Vaughn Clouston skated in from the neutral zone to let Hussey know that the Ice Breakers weren’t going to lie down despite the lopsided score. Clouston received a five-minute major for fighting and a two-minute charging penalty while Hussey took a two-minute unsportsmanlike conduct. Additionally, Vuic, who fought Clouston while sticking up for his teammate Hussey, was ejected from the game. The Ice Breakers had a tough night on the power play, coming up empty despite 10 opportunities. The Enforcers had 10 power-play chances of their own and were able to score on one of them. Both teams fired 31 shots on goal as the Enforcers stretched their winning streak to a franchise-record nine games in a row. For the Ice Breakers, Bonnel’s 18-game point streak came to an end. It was quite a run for the Maryland native, who now leads Mentor in scoring with 11 goals and 19 assists for a total of 30 points over 25 games played. 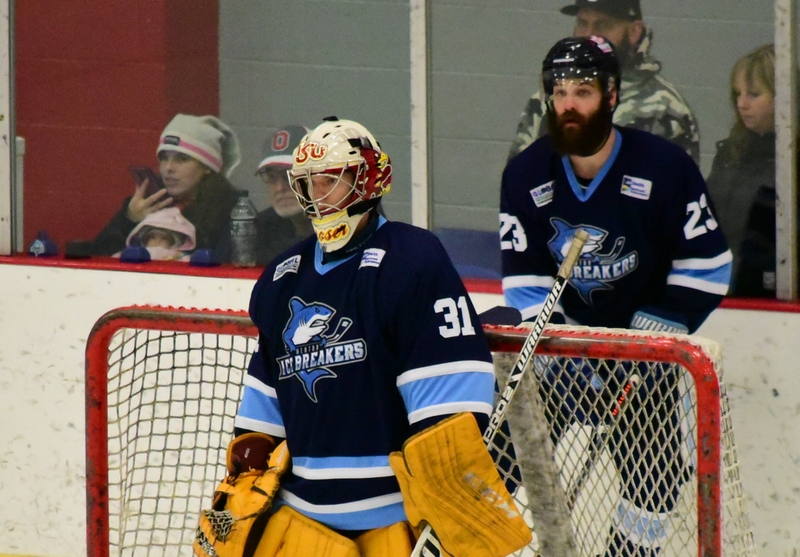 The Ice Breakers will have to move past this one quickly with a three-game series against Port Huron looming next weekend. The Prowlers won both of their games against Watertown this weekend and now hold a 15-point lead over the Ice Breakers for the final playoff spot. If Mentor wants to make a serious run at the postseason, winning the series against Port Huron would be a great way to start.